Stop Debt Collectors Today! Get The Collection Blocker and Get Started Now! STOP debt collection calls (and letters, and emails, and texts) for FOREVER with my free legal letter to debt collectors template! You are getting the same call over and over again from the same person or company. Maybe it’s from a different phone number each time, and maybe it’s not, but they all want the same thing: MONEY or Personal Information. You know who they are, you know what they want, and now it’s time for them to stop calling - forever. Download my free cease and desist letter to debt collectors template with easy instructions and turn off those harassing debt collection phone calls to your cell phone and home phone (and collection letters) for good! You don't need to know how to write a letter to a debt collector because I've already done it for you. This is THE Letter to stop debt collection calls! If you want to know exactly HOW and WHY this particular letter works so effectively, check out section 15 U.S.C. 1692c of the Fair Debt Collections Practices Act. It’s also why you don’t need any legal jargon or citations to the law in this letter. I used to be a debt collector (!) In fact, I was a Senior Executive of a debt collection company and I can tell you that this letter is the one we Feared the Most! Don’t let The Collection Blocker's short length and seeming simplicity fool you - this letter is specially designed to be as devastatingly effective as possible. Trust me. So, have at it and end the collection hassles Today! There’s NO MONEY BACK GUARANTEE (gotcha!) because this is, in fact, FREE* to you. for you - for Free*. (*All you have to provide is an email address, your State, and your first name). 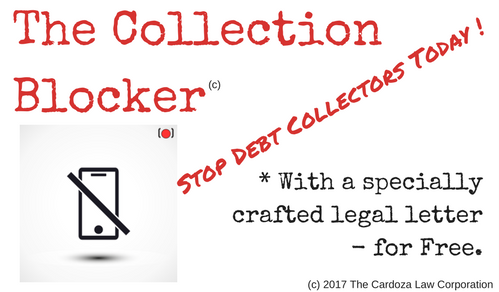 **The Collection Blocker is a specially crafted legal letter that invokes the protections of Federal and State law against debt collectors and creditors. I’ll deliver it to you via email (with detailed instructions) and automatically follow up with you after you’ve downloaded it to find out what happened after you sent it and whether or not you need legal help for follow-on action. Download for Free: The Collection Blocker! Stop being harassed by the collection calls and letters you don't want ...Now. Stop Debt Collectors Today !